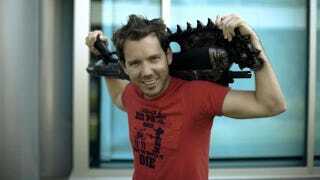 Gears of War designer Cliff Bleszinski did a cool Q&A on Reddit today. It's a great read! 1) How did you get to where you are in the videogame industry? How do you even get selected for leading the development of a videogame? 2) What point in your career did you go from being hired to make a game to being able to get games made? Have you gotten to that point? I imagine you've got quite the sway in the industry after all this time. 3) How much of development gets affected by the people funding the game itself? Is it just timelines or is it common for them to step in to make cuts to affect things like the target audience etc.? 1) I kicked and screamed and clawed my way to where I am today. As I mentioned below, I seldom went out in my teens and 20's and focused on my career. I was never very good at graphics or code but I did both of them anyways and later found folks much better at both that I could work with. Remember, I've been at this for TWENTY YEARS now, as I started at 17. The one constant in this business (and in technology) is change. 2) I just made my own games, it's that simple. I also realized the value of being visible in the industry at an early age. I used to be a drama geek in high school. I played Mercutio in our high school's production of "Romeo and Juliet" and was a lead in our production of "Rumors" as well as "Ten Little Indians." (FUNFACT: I was in drama with Courtney Ford ("Dexter" "True Blood") and we still keep in touch. I got her to do Maria's voice in Gears 2.) Anyways I use those drama chops for interviews and stage presentations and what not. 3)Epic is NOT the typical developer as we are the ones who decide when our games ship as well as the games that we work on. We use a combination of gut and market conditions while also balancing what's best from the engine side of the business to decide what's next. So there you go. Want to be a game designer? Do Shakespeare!